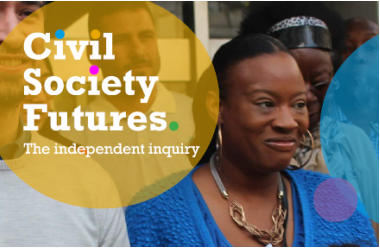 Civil Society Futures (CSF), an independent 2-year inquiry chaired by Julia Unwin, has today published its final report: The Story of Our Times: shifting power, bridging divides, transforming society. The report calls for fundamental changes to how charities and other civil society actors operate, changes which it says are needed to ensure there is more accountability to beneficiaries. It outlines major changes which need to happen in four key areas: Power, Accountability, Connections and Trust (PACT). Two other important reports have also been released; ‘Civil Society in England: Its current state and future opportunity’ and ‘Let’s Talk About Race: Civil society and race equality‘. The reports focus on a shared set of practices and behaviours that CSF has put together from speaking to groups and individuals across the UK. These shared set of practices and behaviours are at the heart of how civil society needs to transform in the decade ahead, to stay relevant and take on the some of the biggest challenges of our time. Find out more about PACT and next steps for civil society on the CSF website.